One can imagine how difficult it might be to leave poolside while on winter getaway to Arizona from Minnesota in March. 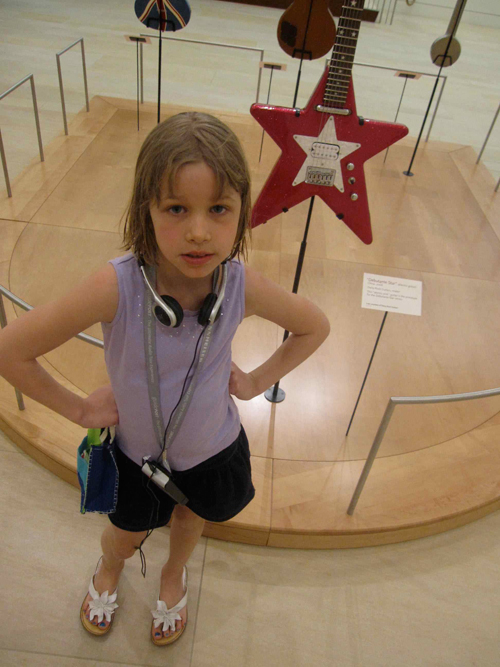 One day of our too-short stay, I rounded up my mom and daughter for a trip to the Musical Instrument Museum in Phoenix (MIM), newly opened in April 2010. It took a bit of convincing, but seeing my fair-skinned daughter becoming increasingly red despite sunscreen, a little break was needed. And while you really can’t do the museum justice in 1.5 hours, that’s what we allowed ourselves for our visit. It was an easy drive from our place. As you approach the museum, it’s serenely set into the landscape and seems of the desert in its sandy, earth tones with metallic lettering. On a Tuesday afternoon, there were no lines and plenty of helpful suggestions on how to make the most of our 1.5 hours. Love love that headsets aren’t an additional fee. They come with the price of admission and in the case of this museum’s design, absolutely necessary for the full experience. We started with a quick spin through the Orientation Gallery (what we called Guitar Gallery) and the museum coolness factor went way up for my 7-year-old. Ava found the Debutante Star guitar to her liking. 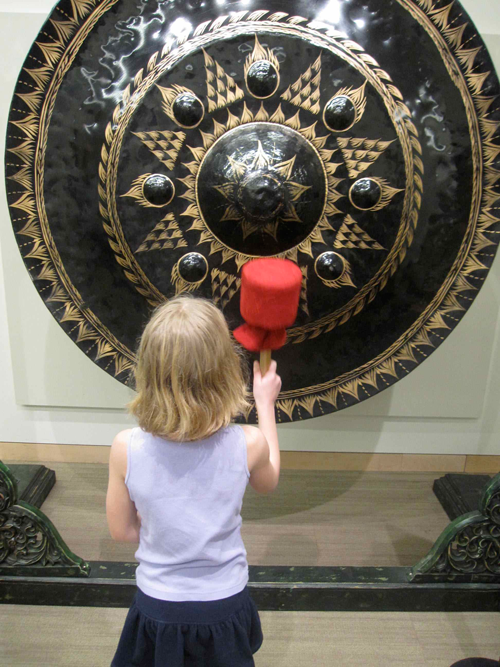 She marveled at the giant floating instruments hanging from the ceiling as we escalated up to the Geographic Galleries, a presentation of musical instruments by regions of the world including audio and video of the instruments being played in their cultural context. We spent the majority of our time in the U.S and Europe. Alaskan Tribal Chants, Hip hop, Rock n Roll and Jazz resonated with Ava. Each with our own headsets we moved about and the music for the closest exhibit would begin to play. Cool and effortless. 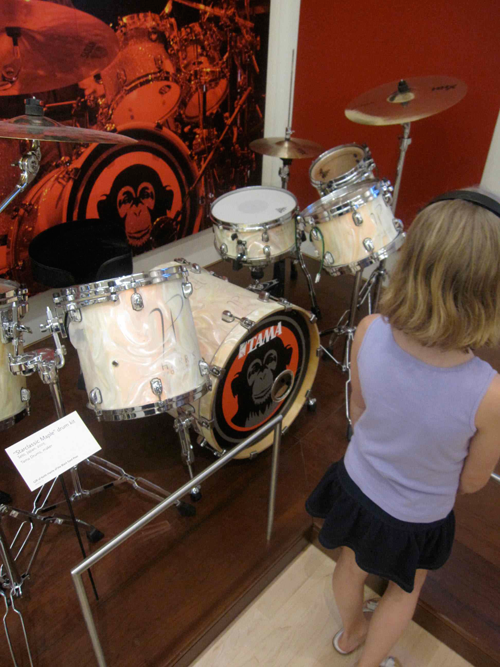 Listening to audio, viewing the videos and seeing the instruments on display – each section with an overview of its musical significance – touched on all the senses and made for a heightened museum experience. One that my daughter could appreciate as she seemingly got lost in her own world, dancing or humming as the music or video evoked. As I looked around, I noted the absence of children in the museum. I suppose it was a Tuesday afternoon, a school day for most kids. We moved through Latin America, four Asian rooms and the Middle East prior to heading back down to the main level. With about a half-hour left, we headed to the Artist Gallery, featuring instruments, video concert footage and more linked to world-renowned musicians and music-innovators. John Lennon’s piano was there with “Imagine” looping. There were also more current artists featured including Keith Harris’ drum set from tour (Harris is the Black Eyed Peas’ drummer). The inclusion of these type of artists made the museum feel happening in a way – acknowledging that even something in recent history that is of the moment can have a place in a museum. With our last 10 minutes, we plucked, twanged and gonged our way through Experience Gallery, where people were allowed to touch and play instruments. Most of these instruments, I suppose for non-germiness, were played by hand. The harp, the xylophone, bells and the massive resounding gong (only one strike per person, please) all got a sound check from Ava. I imagined the sound level with several kids in this room on any given Saturday – potentially deafening. We breezed through the museum store and found a couple of small souvenirs. Ava discovered the White Falconer guitar (magnet version) and picked out a small Indian drum for her brother. And on that very high note, our MIM experience came to an end. What did all of you parents do on Spring Break? I talked with parents last week, polling them. Some were heading to warm winter destinations. Some just took the week of of work and stayed home with their kids and did lots of fun stuff in the cities. Some continued to work, but had some pretty complex play-date schedules planned. Others shipped the kids to the grandparents for the week while they worked. Yet others shipped kids and themselves in different directions (kids to small town MN and grown-ups to Mexico, for example). Unless you are living it up with Shamu and the kids at SeaWorld, you might feel some guilt about doing anything less than spectacular during their week off. I’m here to say, don’t. There is so much running and scheduling in the average week that just the kids being off of school is a relaxation treat in and of itself. No running for the 7:00a.m. bus. No evenings trying to fit practice, homework, dinner and a bath into their schedule. There is something to be said for the luxury of the non-schedule. Also note, in the small town Minnesota of my youth I hadn’t heard of schools having a week-long spring break. Already a perk for my little city-going children. No Shamu, no Disney fairy princesses… It’s okay, really. If I had taken time off work and stayed in the cities with them, our week would have included King Tut at the Science Museum, art camp or classes at Abrakadoodle or a visit to The Works, a hands-on, minds-on museum all about engineering, science and technology. And maybe a movie… although they did walk out of Rango earlier this week with their grandmother as my 7-yr-old could not bear the ending she anticipated. So here’s what we did do for break. No regrets. The kids spent Monday with grandma on one side and have been with their grandparents on the other side since Tuesday. I’m picking them up tomorrow. Until that point in time. I’m on vacation, even if I’m working. Staycation Day 1: Parents: Rainy. Cold. Flat tire on the way home. Uninterrupted reading by the fire. Dinner conversation. Kids: Three hours in the car. Pretending to be ducks and dogs. All I get out of the daily phone check-in is a wack-wack and woof. Staycation Day 2: Parents: Freezing rain. Sleet. Snow. Heavy snow. Popcorn and soda for the big-screen at the historic Parkway Theater at 48th and Chicago. The King’s Speech. Dinner conversation. Kids: Special time with their great auntie. Now they are so far-gone on collective agreement that they’re watching their own movies. Upon check-in, Calvin is still pretending to be a dog, now with a name – Arthur. Ava is pretending to be an architect. Staycation Day 3: Parents: Slushy. Sunny. Optimism abound. Haircolor and bizarre appointment that ends with me looking like a new superhero – Octawoman. Date night in Uptown with a boy I like. Kids: Haven’t quite found time to check-in yet today…. too busy listening to Belinda and I hear her saying vacation’s meant to be spent alone. Until tomorrow at least. As luck might have it and much to my daughter’s dismay, we did not catch a Leprechaun on St. Patty’s Day Eve. On the eve of green, while I was out, my kids and their Dad put together an elaborate trap to catch even the most clever leprechaun off-guard. The scene was set with research and care. In the dark of the dining room, only poorly illuminated by the kitchen light, I arrived late to the scene. I did not see the note. “Leprechaun Trap. Do not Destroy.” This might have warranted a text from my husband to call it to my attention. Or had I not been so focused on tidying up the kitchen and environs at breakneck speed, the green glitter, gold coins and large plastic container pitched up on one side, might have cued me into the trap. Instead, I swept up the green shimmery glitter, sprung the trap by moving the box and vaguely recall seeing some shiny coins. It should have struck me as a bit odd perhaps, but having walked into many a fort, built-work or crazy messy scene when Dad and kids have creative time, it seemed the norm to me. The next morning: Ava, my 7-yr-old, had big tears rolling into her cereal milk (which I meant to taint with a bit of green dye for fun). She wondered why I had to go and ruin it. When my son awoke 10 minutes later, I expected a similar lecture from him: “Did you not SEE the note?” However, he took in the scene and noted that the coins where gone. He suggested that maybe the Leprechaun had come during the night, got the coins and smartly avoided the trap. I went with this and oh they liked this idea. We might get rich yet! I suggested we reset it for the day. Ava was not keen on this, figuring we had missed all chances of catching one until next year (note: instead of shamrock face paintings, her school opted to make her a werewolf of sorts that day?). Bad morning to be on such a tight time line. I had to leave the house at 7:00am for green bagels and a meeting, no time for such shenanigans. I said goodbye to Calvin suited up in his 3 layers of green shirts and delivered Ava to her bus stop. 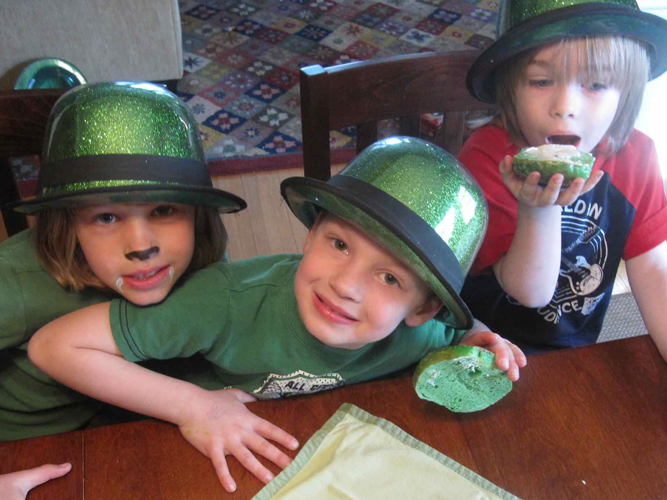 When we arrived home after school, Calvin with his friend, Churchill — I toasted up some doughy Brueggers Bagels that were a bit too green and they donned their Irish bowler hats. Michael Jackson’s Smooth Criminal was on the playlist. Impressive that they made the connection between their hats and MJ’s bowler hat worn in the video of the same name. We talked about all green and all enticing items to the mischievous leprechaun and reset the trap as seen here. We are talking some strategic photographer effort here, getting down to the perspective of a two-inch tall little person’s view to capture what this array of temptations might look like. 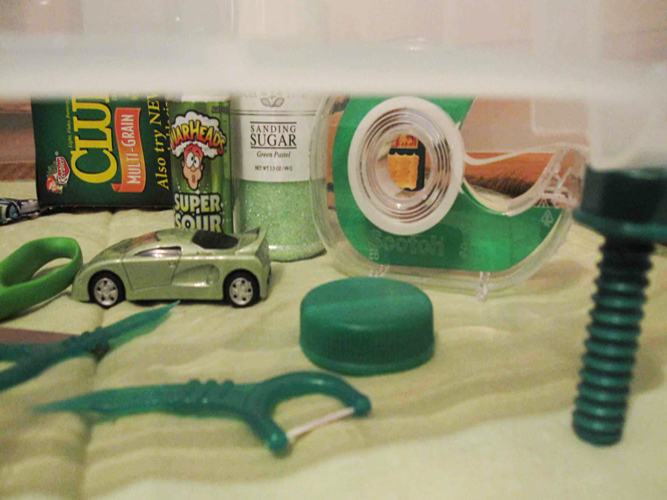 The trap includes scissors, tooth flossers, foam spray candy, tape, Club crackers made by Keebler Elves (elves being akin to leprechauns and all), glitter, a tiny green speedy car and a screw to hold the entire thing up. The screw is rigged to the car so when the leprechaun tries to speed away, their fate is sealed. Obviously we are not going to catch one. What should I tell the kids on the morning of March 18, when there is no gold? 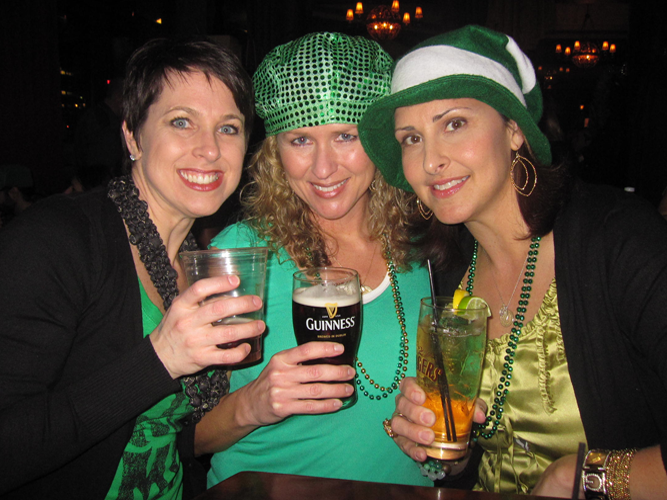 Note: During this day of March Madness, Grownups Robyn, Lisa and Jen enjoyed some shenanigans of our own at Coopers – – indulging in the Cougar Burger and Ginger Irish Whiskey. 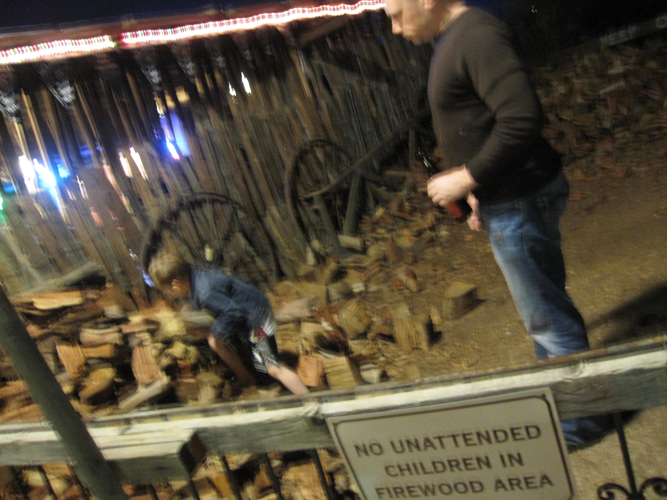 Starting a Fire at Greasewood Flats: A Good Idea? A good vacation should transport you. This past week in Scottsdale, Arizona and surroundings, we wanted to feel transported to the Southwest and tap into our inner cowboys. 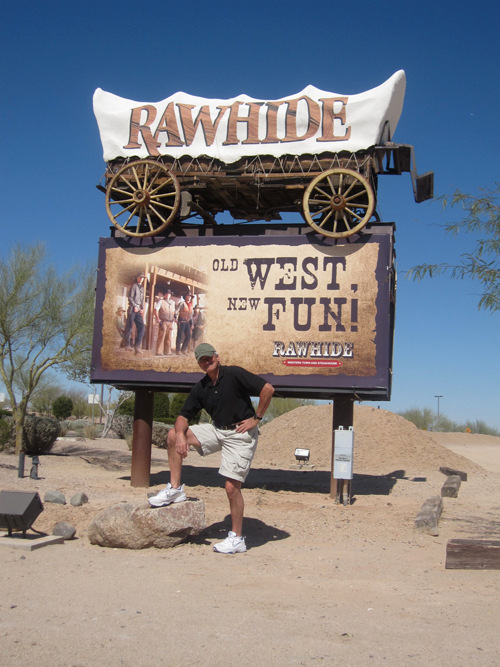 While I’m not willing to camp out under the desert stars with the rattlers, we did our fair share of hiking and visits to Greasewood Flats, Rawhide and the Rusty Spur. The differences between the Midwest and Southwest as rediscovered through a 5 and 7-yr-old were heightened and interesting again. I recalled many times my memories of 6 maybe 7 extended trips to the area from ages 7 – 15. From temperature to landscape and language to lifestyle, everyday things continued to keep the inquisition flowing. Not to mention the nagging question for me, why didn’t I go to ASU? The kids wondered about the faraway illusion that cactus needles are soft and the close-up reality of their prickliness. Could you actually eat the oranges and lemons on the trees in our VRBO home’s backyard? Where did they come from? (we get ours at the store) Why can’t we start a fire at a bar in Minnesota? Our answers unfolded throughout the short 4-day stay. It started with a trip to Greasewood Flats. This southwestern hang-out came straight out of Radiator Springs of Cars movie fame. The winding unpaved dusty roads leading to the joint had separate dunes breaking out horse, biker and truck parking. You could actually gather your own firewood and start a fire near your outdoor picnic table. There was live music, spurs, spit and dust – authentic alright, and a tough crowd you wouldn’t think sympathetic to my chasing a madder than all-get-out sleep deprived son around the premises. We left early. Next day. An hour-long hike around Piestewa Peak (formerly known as Squaw Peak). And at 3:00p.m. in the afternoon, the trails had a hot and dusty, lazy feel to them. We took the circumference trail and shied away from the summit (the next day, grown-ups realized this was a wise choice). There were at least four different major cacti that this city girl could discern. 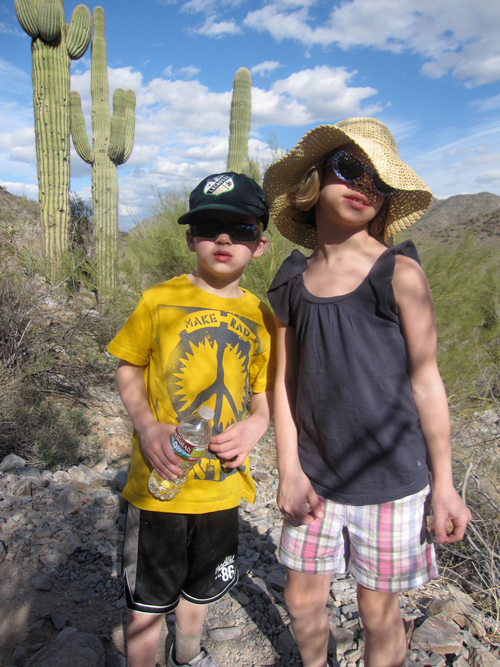 The terrain was rocky in parts, but very manageable for kids, not much traveled and satisfied their desire to explore. I’m happy to report that the only critters seen were in our ZipLoc bag of animal crackers Calvin couldn’t live without for the duration. We spent the next few days living it up by the pool, golfing and visits to Taliesin and MIM and on the last day we went to Rawhide. Similar to the devastation that only a Griswold has felt, we arrived at the boarded up, shut down Rawhide at 1:00 in the afternoon. Apparently, Ghosttown was being featured that aft. (They are open 5-9 nightly). Sadly, we trek it back to Scottsdale. Scottsdale’s Old Town was a easy visit. Ava and Calvin chatted it up with the locals. We bought some special “rocks” – jaspar and the like. 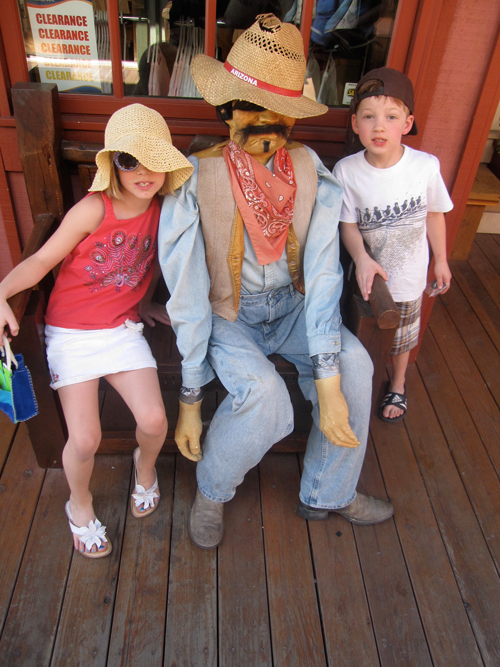 After the women and children shopped, we met up with the boys who wandered into the Rusty Spur Saloon. Surprisingly good Mexican food and a live guitarist taking requests. We heard our second request of the vacation for Seminole Winds live (a favorite of Papa’s) and called it a vacation at that. We said goodbye to the petroglyphs that adorn the roadsides, the great saguaros and the mountain shaped like a camel’s back. I swear, we’ll be back. When we arrive at our destination, my daughter’s suitcase will have its own packing list like an official shipment from a factory. She started the list nearly three weeks ago for our 4-day vacation. It’s a warm-weather one mind you, so all of last summer’s wardrobe needed a quick try-on to assure fit. The list includes swechrts (sweatshirts), flipflops (spelled correctly!) and braclits (bracelets). 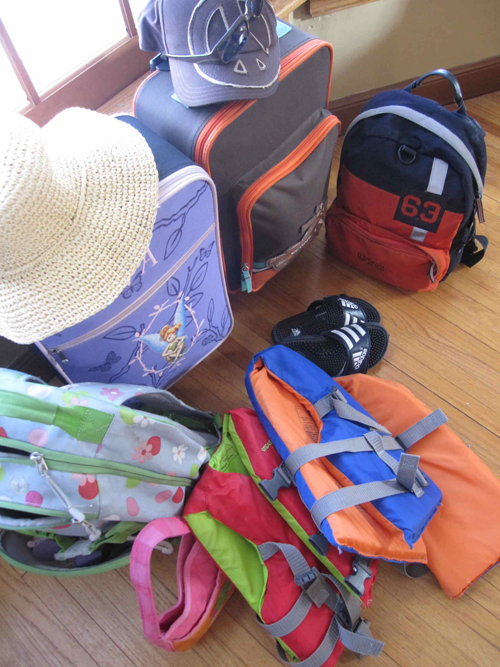 I am reminded of vacations prior to kids when I’d leave packing until the last minute. No more. For sanity’s sake, it needs to be planned out. Three weeks out – clothes shopping. Ava needs a new sun hat, swimsuit, sunglasses, tennis shoes (for all of the hiking she plans to do at our destination) and a cover-up. Calvin needs new shorts, sunglasses and a cool trucker/skateboarder hat, he convinced me. Us parents are going to make due with what we have with the exception of some trendy sunglasses from Target and a timely order of new jewelry from Stella & Dot. 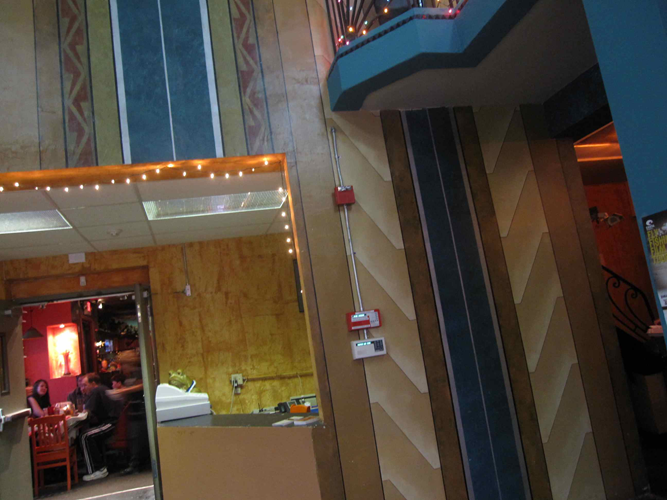 One week out – haircuts. See previous blog about the cuts and you’ll understand why this task is not left to last-minute. Plus I always hear people say you need at least a week for your new ‘do to figure out what to do. During this week, the kids started laying out their stuff too. Especially Ava. We talk about activities we’ll be doing, the weather and she makes her list of stuff to bring accordingly. Here’s when I start to get overwhelmed. 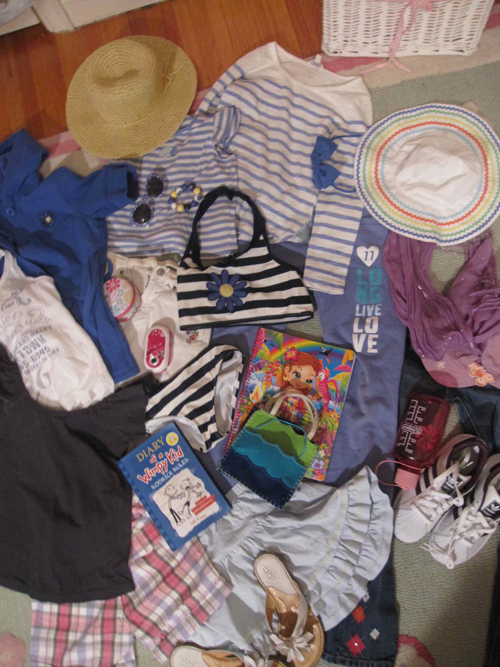 Not only are there clothes, coats, shoes, lifejackets (for pool and boat), but reading materials, toys, cards and all sorts of things to play with are also in the mix. I haven’t even thought once about what I’m packing and we’re three days out… I do manage to schedule a pedicure with my brother’s girlfriend for the Saturday morning prior to our flight. I will be super excited about that when the time comes. 2 days out – laundry. I think I’ve done 8 loads of laundry in less than 24 hours. Luckily, I like my wild cherry appliances and their efficiency so much it eases the task a bit. We start three sections for clothes to pack on our dining room table with 2 leaves in, making it 104″ of organization. The kids have yet another dance party to the AZ mix my husband made for them/us last week “– uno, dos, tres, quattro… I have condo we can stay…” Never gets old. Day of – waiting. packing. I don’t think I’ve ever taken a 9:30p.m. flight to a vacation destination. Typically, we’ve scheduled the earliest flight possible in the morning. I’ve been up since Calvin came up to our room at 5:45a.m. to ask if we were excited that today is the day we go on vacation, reminiscent of Christmas morning anticipation. We have four hours until we leave for the airport. My 5-yr-old is taking the longest nap of his career this year and my 7-yr-old is splashing it up at a birthday party at Foss Swim School. I should really get packing. I can relax later. I penciled that in for Tuesday between 10:30a.m. and 2:30p.m.